Anthony Saunders stunning print shows Lancasters of 617 Squadron as they successfully breach the second of Germany's mighty western dams - the Eder, on the night of the 16/17th May, 1943. After hitting the target with pinpoint precision, pilot Les Knight and Flight Engineer Ray Grayston battle with the controls of Lancaster AJ-N in order to clear the high ground beyond the dam as a torrent of water erupts into the valley below them; the wall of the Eder Dam is rent apart and collapses. 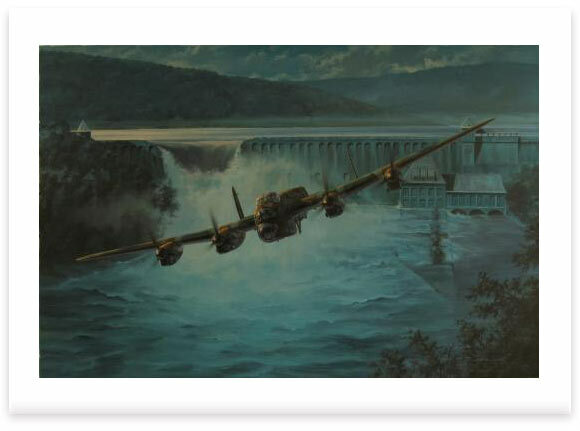 The following Dambuster veterans who were on the crew that actually breached the Eder Dam have signed every print. Each copy is also signed by the artist, and hand numbered.